Food Technology Reference from C.H.I.P.S. 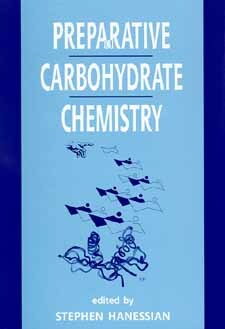 Offers relevant chapters on reactions and derivative forms of carbohydrates, including commonly used methods as well as new experimental procedures. Also contains insightful chapter commentaries and succinct topic histories. Synthesis of Isopropylidene, Benzylidene, and Related Acetals. Regioselective Cleavage of O-Benzylidene Acetals to Benzyl Ethers. Selective O-Substitution and Oxidation Using Stannylene Acetals and Stannyl Ethers. Sn2-Type Halogenation and Azidation Reactions with Carbohydrate Triflates. Direct Halogenation of Carbohydrate Derivatives. Nucleophilic Displacement Reactions of Imidazole-1-Sulfonate Esters. Free Radical Deoxygenation of Thiocarbonyl Derivatives of Alcohols. Thiazole-Based One-Carbon Extension of Carbohydrate Derivatives. Selected Methods for Synthesis of Branched-Chain Sugars. O- and N-Glycopeptides: Synthesis of Selectively Deprotected Building Blocks. Oligosaccharide Synthesis from Glycosyl Fluorides and Sulfides. Oligosaccharide Synthesis by n-Pentenyl Glycosides. Chemical Synthesis of Sialyl Glycosides. Glycoside and Oligosaccharide Synthesis with Unprotected Glycosyl Donors Based on the Remote Activation Concept. Oligosaccharide Synthesis by Remote Activation: O-Protected 3-Methoxy-2-pyridyloxy (MOP) Glycosyl Donors. Oligosaccharide Synthesis by Remote Activation: O-Protected Glycosyl 2-thiopyridylcarbonate Donors. Oligosaccharide Synthesis by Selective Anomeric Activation with MOP- and TOPCAT-Leaving Groups. Oligosaccharide Synthesis by Enzymatic Glycosidation. C-Glycosyl Compounds from Free Radical Reactions. Functionalized Carbocyclic Derivatives from Carbohydrates: Free Radical and Organometallic Methods. The Conversion of Carbohydrates to Cyclohexane Derivatives. Total Synthesis of Amino Sugars.